PLUS MORE GAMING SECRETS AND RUMORS: Possible information on the new Deus Ex game, including its protagonist | Namco Bandai's plans for the Western gaming world | Something new from Rockstar...could it be GTA V DLC? A relatively unnoticed 2012 GDC Europe postmortem presentation on 2K Czech's Mafia II by designer Jarek Kolar provides some fascinating insight into a protracted, troubled development process, and might even give some cause for concern for the much-rumored third Mafia game. According to Kolar, work on Mafia II's script began in 2003—seven years before the game's 2010 release—and developers began pre-production on the title in 2004. 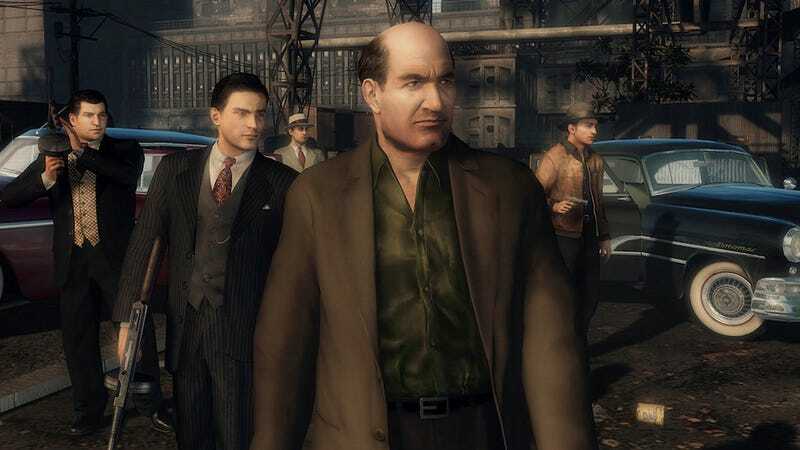 Originally, 2K Czech—then known as Illusion Softworks—intended for Mafia II to be a PS2 and Xbox title with a licensed engine for a fast development turnaround, but the engine developer went out of business and the game's development moved to then-next-generation consoles, PS3 and Xbox 360, in 2005. Those two factors proved to be a major setback for Illusion, forcing the studio to work on its own proprietary next-gen engine for Mafia II, and the development team would not have a "Playable something" (whatever that means) until 2007 or 2008. Kolar said the developer's excessive focus on visual details came at the expense of having adequate time to implement "Player control and animation," "Cars and city traffic" and a more adequate loading and saving system. The developers were also hamstrung by the fact that the "Story [was] written in isolation [prior to] the [game's development and knowledge of game mechanics]," which turned the game into a "Narrative experience" at odds with the sandbox environment. Due to the emphasis on the game's narrative and visual elements, gameplay became a tertiary concern. When identifying the issues that plagued Mafia II's development, Kolar seems to pinpoint some of the same problems affecting another once-beleaguered 2K Games project, BioShock Infinite. Like Irrational, 2K Czech spent a lot of time pursuing game elements that were ultimately thrown away because developers deemed them unsatisfactory. Similar to the tales of Irrational unsuccessfully trying to turn the seemingly open-ended BioShock E3 demos into something tangible, Kolar believes there was a "Lack of realism, honesty and criticism" within the Mafia II team, leading to inadequate "planning and decision making" and "Continual deception." In explaining the latter problem, Kolar singled out the phrase "In 6 months it's finished" as falsely giving the impression development on Mafia II was further along than it actually was. In the lone press report that covered part of the GDC talk, Polygon's Emily Gera adds that Mafia 2 was not really playable or able to be tested until fairly late in the development process, and developers had to "imagine" playtesting the title "on paper." Around the same time as the GDC Europe presentation in August 2012, Eurogamer.cz reported that 2K Czech was indeed in the early stages of working on a Mafia III for a post-launch window release on the then-unannounced next-generation Xbox and PlayStation consoles, meaning the developers would have to revamp their tech base and game environment for new technologies. Eurogamer also claimed 2K Czech was further troubled by recruitment woes, and the studio found itself having a hard time luring back talent after layoffs in 2011. It remains to be seen whether 2K Czech might be in for another rocky console generation transition for their next game, but Eurogamer made note of 2K Czech's autonomy from its corporate parent—something that could very well exacerbate development issues, particularly given the studio's physical distance from 2K's North American headquarters. Whatever is the case, the seven-year journey of Mafia II fits with an interesting trend of lengthy development cycles for 2K titles, like the six years it took to make Spec Ops: The Line and The Bureau's eight-year adventure. As to when we might hear of an announcement of 2K Czech's next title is unclear, but the developer's Twitter account hinted at something relatively soon, though it might be worth noting there was a three-year gap between Mafia II's 2007 announcement and 2010 release. A recent casting call for an unnamed Montreal-based "Confidential Video Game" motion capture project may very well be giving away some very brief details about the next Deus Ex game. The casting call is for a Japanese character in his early 30s named Hiroshi Saito. In the copy, Saito is described as "an Illuminati Shadow Agent" whose "current assignment is to infiltrate the Augmented Rights Coalition, to replace its leader and to discredit its movement by committing a series of attacks in their names." He is also "fierce, unsympathetic, cunning, and arrogant [as well as] Disciplined, unemotional, intelligent, gritty." Additionally, he is "able to range from professional with his superiors, militant when undercover, and smirky when talking to enemies." Although the casting call makes no mention of Deus Ex, that series is obviously the only Montreal-based gaming project that meshes with mentions of the Illuminati and augmentation. The "Augmented Rights Coalition" squares with the notion of "trans-humanism segregation," which was discussed in last week's announcement of the next Deus Ex game. Namco Bandai's European division recently registered a new round of domains that appear to give some insight into the Western arm of the Japanese publisher's future plans. At the end of last month, Namco Bandai Europe registered a bevy of domains, including: shortpeace-game.com, tenkai-knights-game.com, wwvs-game.com, narutorevolution-game.com, pacmanghostlyadventures2.com, one-piece-unlimited-world-red.com, awakened-legends-game.com, and awakened-legends-vs.com. The Short Peace domain would presumably suggest a Western localization could be in the cards for Ranko Tsukigime's Longest Day, the colorful sidescroller tie-in from Suda 51 and Toyko Jungle developer Crispy's hitting Japanese shelves in January. My admittedly anime-illiterate self is going to try not to confuse that with the One Piece domain, which likely indicates Namco is also planning to bring the forthcoming 3DS anime game One Piece: Unlimited World Red to Western territories. Despite the first Pac-Man and the Ghostly Adventures game being weeks away from release, Namco seems confident enough in its attempt at making Pac-Man relevant to today's kids that it is already thinking of a game sequel, if the registration of a domain for a sequel is anything to go by. Tenkai Knights and Naruto are evidently tie-in games to those respective anime series, and I wonder if Naruto Revolution might be a free-to-play game along the lines of the similarly titled recent F2P release Tekken Revolution. And perhaps "Awakened Legends" or "WWVS" could be a Western title for a localization of Namco's forthcoming Vita/PS3 cross-anime fighting game J-Stars Victory Vs.? Finally, on their CV, a staffer at Rockstar's New England support studio vaguely says they are now working on the "Next version of a famous IP" following the completion of work on Grand Theft Auto V. This is vague, but it does seemingly disqualify Agent, which, of course, is not a preexisting IP. Ostensibly, one could argue potential GTAV DLC might qualify as a "next version." I would personally guess this "next version" is that or the much-wished-for third Red Dead game, though I personally long for a Bully follow-up.